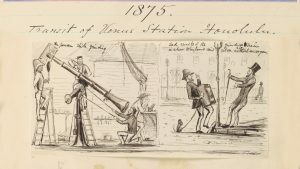 Dr Rebekah Higgitt introduces a digitised collection papers, photographs and drawings relating to the history of astronomy, now available at Cambridge Digital Library. Funded by the University of Kent and the British Society for the History of Science, her project has made items from the archive of the Royal Observatory, Greenwich, and a private collection available to the public. 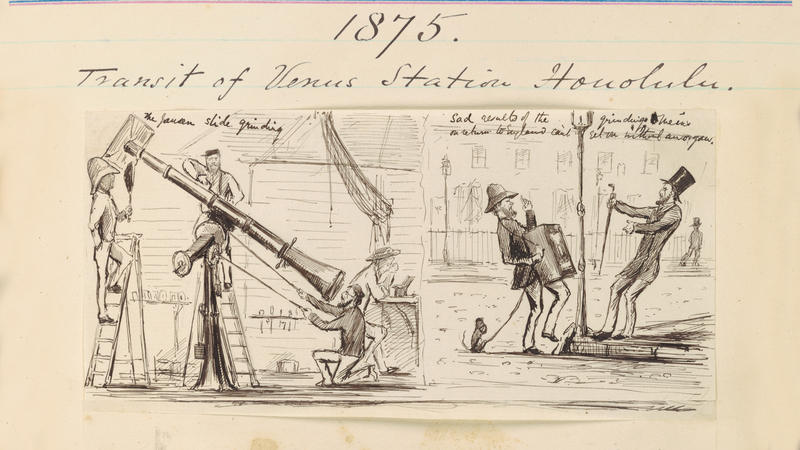 They focus on the British expeditions organised to observe the 1874 transit of Venus, particularly the one made to the Sandwich Islands (Hawai’i). The collection includes photographs of the observing instruments, huts and sites; details of the equipment and provisions taken overseas; official and private journals and a truly unique set of caricature drawings that follow the “Life and Adventures” of the Hawai’i observers. To see the digitised papers click here.